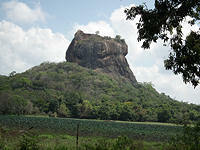 We started the Sri Lanka tour proper on the second day with a morning visit to the famous 'Lion Rock' at Sigiriya. It is a good idea to start the 14-day tour with this visit to Sigiriya as it needs strength and energy to climb the hundreds of steps up the Lion Rock, some quite steep. There are usually a lot of people climbing too, especially at the weekend and public holidays. It is important to pace yourself, not try to follow the guide who shot the hill like a goat. Rob and I would stop for a rest and some water now and again keeping our guide ahead waiting for us. Although it was mid-morning, the sun and the heat were already on top of us. We were drenched in our own sweat. We had brought along a walking stick each and this was very helpful for the steep climb. We are not as young and fit as we once were. Despite all this it was worth a trip to see the Royal Gardens, frescoes (wall paintings on the rock), the Mirror Wall (Graffiti inscribed dating back to the sixth century), the Lion Paws and the Summit. We did not go right up to the summit as it would have required another climb of several hundred steps on a narrow metal stair used for ascending and descending at the same time. I am not good with heights so we decided not to make this final climb to the top of the Rock to see what remains now which is just the foundations of the king's palace. After the Rock we drove to nearby Polonnaruwa. 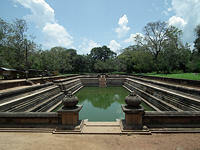 This ancient city was once ruled by kings of the central plains of Sri Lanka. This ancient site is divided into many groups. We started the tour by visiting the Archaeological Museum, then visited the Royal Palace Group that includes the Royal Palace, the Audience Hall and the Bathing Pool. Most of these buildings are now reduced to just a few pieces of stone and some pillars. Next we visited the Southern Group for the most famous Statue, a larger than life standing Buddha. 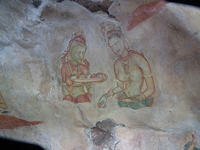 The Northern Group includes the Gal Vihara, where there are four beautiful Buddha images: one standing, two seated and one large reclining image. They are all beautiful rock carvings. We also visited Nissanka Malla’s Palace, the Royal Baths and the King’s Council Chamber in the Rest House Group. After a refreshing king coconut drink we drove back to the hotel for relaxing time by the hotel pool. Before leaving Habarana next morning, we inspected another hotel, the Chaaya Village, which we use in our Superior hotels category. This hotel is next door to Cinnamon Lodge and is managed by the same company, Cinnamon Hotels Group. The style of this hotel is different to Cinnamon Lodge, with a more rustic cottage style, lovely gardens and lakeside. The manager told us that sometimes they have displays of craft techniques, cooking and so forth arranged like a local village fair in the hotel gardens for clients to enjoy. A drive of an hour or so brought us to Anuradhapura. The ruins of this ancient capital city date back to 380 BC and comprise many architectural wonders: enormous dagobas, soaring brick towers, ancient pools and crumbling temples. 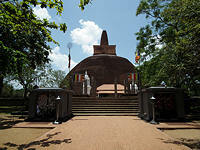 We visited Abhayagiri Dagoba, the Moonstone, Kuttam Pokuna (twin ponds), Mahapali Refectory and Samadhi Buddha etc. 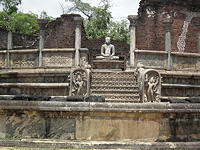 The seated figure of Samadhi Buddha is considered one of the finest Buddha statues in Sri Lanka. It is beautiful and calming. After the morning tour we visited the Palm Garden Village Hotel, a hotel we use in our Superior hotel category. Like its name suggests the hotel is situated in a large and lush garden with bungalow style rooms circling the lovely central swimming pool. All rooms are decorated in local style. Afterward we checked in at Ulagalla Resort. This is a very unique hotel built in sixty acres of land, gardens, forests, jungle and lakes. There are only twenty individual chalets each with its own private plunge pool in the entire sixy acres. Arrival at this hotel involves a welcome ritual of ringing a bell and lighting a candle before checking in. To go to our chalet required a 5-10 minute by hotel buggy to the door step of our room. The chalet is built on a high level on stilts. We walked a few steps up the path to the first level, a private decked patio area with table and chairs and two sun loungers by the private plunge pool before entering the chalet. The door opens to a hall with bedroom on the left hand side and sitting room on the right, including a dining area with a dining table already set. The whole room is really a one bedroom apartment. The large bathroom is behind the hall. The whole chalet is spacious and beautifully presented within a peaceful and rural environment. 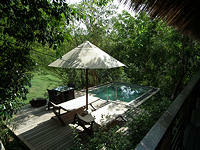 The view from every window of the room is of trees, lawns, greenery, and our private plunge pool. This is the most private hotel accommodation that I have ever been to. It was a pity that we only stayed for one night, which is not enough to enjoy this special hotel. We are going to include a three night stay here in a new 'Sri Lanka Deluxe' tour itinerary. Next morning we left for Kandy.